Will there be another application in the Spring? No. This will be the only application period for the Fall 2019/ Spring 2020 academic year. Awards will be determined in early July 2019 and money will be applied to your YCCC bill at the end of add/drop for each semester. Any eligible Maine student who is registered, or intends to be registered at York County Community College (YCCC) for at least 3 credits during the spring semester may apply. Dual Enrollment Students are not eligible. This is the one application for all scholarships that the YCCC Foundation manages and all scholarship awards are reported to the YCCC Financial Aid Office. Each potential recipient must be officially registered for courses by the time applications are evaluated (late June) to be considered for an award by the YCCC Foundation Scholarship Committee. Complete the YCCC Foundation Scholarship Application below. Make sure that all sections are complete, especially the personal statement. Incomplete applications will not be considered. Applications are only complete when you have received your Survey Monkey confirmation notification. Previous applicants report that it takes, on average, 4 minutes to complete the entirety of the application (excluding preparation time for the statement portion). Creating your statement in Microsoft Word is highly recommended, simply cut & paste your completed essay into the body of the applications #10 statement section. Please note that the program limits this to 1000 characters (about 250 words) which may differ in Microsoft Word, so please plan accordingly. The deadline is May 10th at 4:00 PM EST. Applications received after this date and time will not be considered. When will scholarship be awarded? 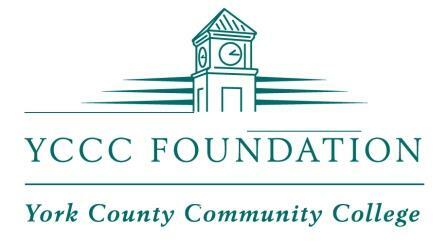 The YCCC Foundation Scholarship Committee will begin awarding scholarship by early July. How much might I be awarded? What is the YCCC Foundation? The YCCC Foundation was established in 1995 as a private, nonprofit corporation to support the students and faculty of the college through gifts from organizational and individual friends of the College. The YCCC Foundation has distributed over $200,000 in financial assistance over the past 5 years.